We began planting wheat for our spring silage crop on Monday. All in all, we expect to no-till drill the seed into 90-100 acres. Half of that ground is cropland on which we grew our sorghum crop this summer. The sorghum has experienced a little over a foot worth of regrowth thanks to a warm October and late frost, but it shouldn't impede the wheat's germination or growth. The rest of our acreage will be in hay fields, and to get a good crop establishment there we will have to delay planting until after a killing frost. We will "shallow till" by breaking the top of the ground with a disk. We will spread manure slurry to incorporate nutrients and organic matter. We will use a section-harrow to fill-in/level rough spots and smooth the ground prior to planting. Finally, we'll use our seed drill to plant wheat and ryegrass into the prepared ground. A homemade drag attached behind the drill will help cover the seed and finish smoothing the ground. We'll be able to apply additional slurry once the wheat/ryegrass establishes well enough to stabilize the ground. There is a chance we can graze the herd on this land before the end of the year if we have a mild November, but we'll likely be looking at early spring before we get much benefit from it. God bless, and y'all have a "dairy" good day! After months and months of spin, misrepresentations, gaffes, attack ads, and robo-calls, the Presidential Election is almost upon us. With Americans tuned in so intently to the political back-and-forth, farmers have seen an opportunity to throw a little dairy promotion into the mix. One great example of that is Tennessee dairyman Ryan Bright's series of blog posts detailing one of his cow's campaign for POTUS. Joining in on the fun, a few of my fellow farmers have started using the #TeamDairy hashtag on Twitter. 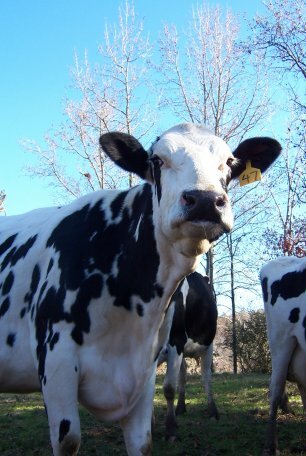 "Team Dairy" is meant to represent farm families, our cows, dairy products, and everyone that supports us. Be sure to look for #TeamDairy updates from farmers around the country (actually, around the world), and feel free to tweet it yourself to show your support. 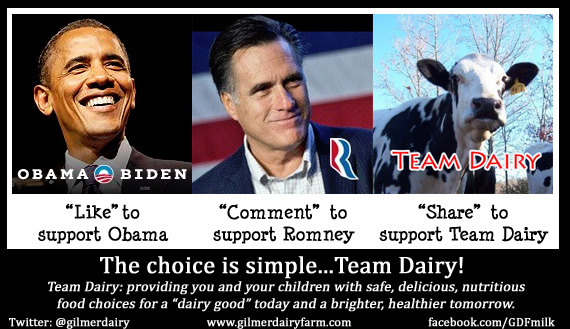 And remember, Team Dairy has been around far longer than this election cycle and will continue to be a force for good regardless of who we elect as President. Team Dairy: providing you and your children with safe, delicious, nutritious food choices for a "dairy good" today and a brighter, healthier tomorrow. In closing, I'll leave you with a couple of "cheesy" (get it?) "Team Dairy" promotional pieces I've put together. The first is a meme I posted on our farm's Facebook page, and the second is a poorly-constructed attempt at a political ad. I hope they make you chuckle a little bit, and feel free to share with your friends. Tweet me a pic of a jug of #milk in your fridge by 10pm and be registered to win my undying appreciation! I've seen several pairs of jugs today. My little request started to get noticed after that, and between then and now I've had about two dozen people answer my call. There is quite a bit of diversity in people's tastes, as I've seen skim milk, 1%, 2%, "whole" milk, half & half, chocolate milk, and on and on and on. Some jugs have been full, some near-empty, and have ranged from quart to half to gallon sized. There has even been quite a range of respondents, including college students, former high school football teammates, and even a television meteorologist! If you have a Twitter account, join in on the fun! Take a quick snapshot of the milk or other dairy products in your refrigerator and upload it along with the hashtag #showmeyourjugs! And thanks for being such a great supporter of America's dairy farm families such as mine! October is National Breast Cancer Awareness Month, and the Southeastern United Dairy Industry Association (our regional check-off) has teamed up with Dean Foods to raise both awareness and funding for research. To participate, simply visit SUDIA's #ThinkPink page and enter your name in the text box. They will convert it to a pink cow-print image file for you to share over various social media sites. For each image generated and shared, Dean Foods will make a contribution to breast cancer research. So "Think Pink" and make tracks on over to SUDIA's webpage today! Meanwhile, the dairy side of the farm just keeps on keeping on. We currently have 155 cows in the active milking herd after "drying off" 23 pregnant cows. Milder weather has led to a decrease in heat stress and an increase in their appetite, so we're starting to see a slow but steady improvement in their milk production. The cows' production should jump even more as we soon begin to incorporate the new silage into their feed ration. While we have been busy in the field and in the milking barn, Congress has been sitting on their thumbs...or at least when it comes to farm policy. The House of Representative's failure to take action on a new Farm Bill with updated dairy policy is bad enough, but their refusal to even extend current policy left dairy farm families like mine operating without a safety net when the 2008 Farm Bill expired on September 30. They say the matter will be addressed in November after the next elections, but only time will tell. And with that, I shall let you get on with your day as it is about time for me to get the silage chopper rolling. I hope you all have a great Friday and a "dairy" good weekend! Borden Dairy Company is currently running a promotion in which they will give away four tickets to each of the University of Alabama's final four home football games of this season: Mississippi State (Hail State! ), Texas A&M, West Carolina, and Auburn. Check out www.bordenultimatefan.com or their FaceBook page for more details. Now to quickly take the focus off of 'Bama, let me tell you just a little bit about Borden Dairy Company. Borden owns and operates a milk processing plant near Dothan, Alabama. The dairy cooperative we're members of has a supply contract with Borden, so all of our cows' milk is shipped to and processed at their Dothan facility. From there it goes on to grocery store coolers and your refrigerator in containers stamped with the plant's unique code, "3801". So there you have it! If you're a fellow Alabamian or a resident of Mississippi, buy lots of Borden milk products and maybe you can win one of the sets of four tickets to a game in Tuscaloosa. And if you would rather endure an anesthesia-less root canal than spend an autumn Saturday surrounded by 100,000 Bammers, you could always give your tickets away to a friend or a charitable youth organization. Either way, just make sure you and your family are getting three servings a day of delicious, nutritious dairy products!